The modular rabbit hutch is individually put up and dividable as needed! With the insertion of partitions, you can divide the residence in up to 4 smaller stables. Your animals can use the two ramps to get to the top flor, a protected area and the ideal retreat for rabbit, hamster or other small animals who need to rest. They can also return to the cantilever free-running zone. Perfect to run a bit. The reside has a large lattice window. So you can watch the animals on all sides. The lower floor is easily accessible from the outside through 3 doors. The upper living area also has a door with barred windows to get quickly and conveniently to your litlle ones. There is a removable drawer on the intermediate floor for quick and easy cleaning. The roof is provided with a solid fitting (asphalt mats). 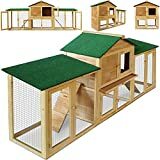 This entry was posted in Small Animals and tagged Adaptable, Cage, Drawer, Floors, HUTCH, RABBIT, Removable, rodents by One Boutique. Bookmark the permalink.